Last week the spread of information around Homo naledi was huge. But there was another hugely important publication in the human evolution field: the results of the partial sequencing of nuclear DNA from the Sima de los Huesos site in Atapuerca, Spain. The samples were taken from two fossils, a femur and a tooth. This project is carried out by the Max Planck Institute for Evolutionary Anthropology. 1) The analysis is still partial. They are only some initial results. The human nuclear DNA is c. 3 billion base pairs (nucleotides) and they are reconstructing small fragments of c. 20-30 pairs each. They have been able to sequence 1 to 2 million pair bases so far (0.1%). The amount of work is huge…! The overall target is to reach an assemblage fraction of c. 0.5% to 1% of total nuclear DNA. That will be meaningful to determine the evolutionary relationships. A) They are early neandertals (‘pre-neandertals’) or related to early neandertals: They gave rise to the ‘classic neandertals’. A formal classification would then be required for them – maybe even a new species. B) They are in fact the earliest known neandertals. This option is widely discarded by scientists, who are aligned more around the first option ‘A’: the partial sequence of the nuclear DNA is consistent with Sima people being pre-neandertals. 3) The full analysis, when finished, will not be enough to fully characterize the population form. For this, they would need a much higher fraction of at least 10%, which is almost impossible considering that this is the oldest human DNA recovered (430K years). Eventual interbreeding between the denisovans and the Sima populations. A common ancestor of neandertals, denisovans and the Sima populations. 5) If confirmed, the results will push back the H. sapiens-H. neanderthalensis ancestor beyond 400 KYA. Meyer suggested that the ancestors of H. sapiens could have diverged from the branch leading to neandertals and denisovans 550 K to 765 K years ago. It may be possible that H. sapiens evolved in western Eurasia and later migrated back into Africa. The fossils from Europe, Asia and Africa in the 400 Ka. period are physically very diverse and may represent multiple species, only one of which could be the ancestor of today’s humans. 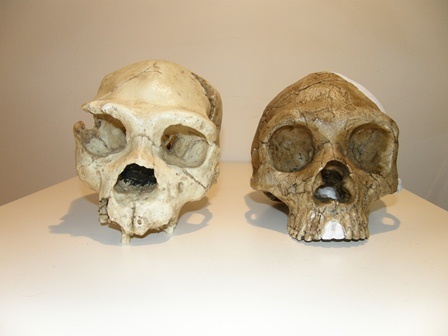 For example, Chris Stringer thinks it may be needed to look at Homo antecessor and not Homo heidelbergensis as our last common ancestor with neandertals. Do you want to know more about Sima de los Huesos? Check out this post to know everything about this amazing site! All info + slideshow here. Esta entrada fue publicada en Actualidad y etiquetada Atapuerca, Genómica, Genomics. Guarda el enlace permanente. If the Sima population is related to neanderthals, it cannot be ancestral to neanderthals (_Homo neanderthalensis_) and people (_H. sapiens_). Also, Linnaean taxonomy requires at least an initial of the generic (first) term of the species name to accompany the trivial (second) term, and you should italicise or underline all Linnaean genus and species names. Fully agree Todd. Amended. Thanks.